The cradle of Western civilisation, Ancient Greece was a land of contradictions and conflict. Intensely quarrelsome and competitive, the Greek city-states consistently proved unwilling and unable to unite. Yet, in spite of or even because of this internal discord, no ancient civilization proved so dynamic or productive. The Greeks not only colonized the Mediterranean and Black Sea areas but set standards of figurative art that endured for nearly 2500 years. Charting topics as diverse as Minoan civilization, The Persian Wars, the Athenian Golden Age and the conquests of Alexander the Great, the book traces the development of this creative and restless people and assesses their impact not only on the ancient world but also on our own attitudes and environment. The authoritative narrative, illustrated with over sixty full colour maps and over seventy plates, makes this an indispensable handbook for history students and enthusiasts alike. The cradle of western civilization, Ancient Greece was a land of contradictions and conflict. Intensely quarrelsome and competitive, the Greek city-states consistently proved unwilling and unable to unite. Yet, in spite of or even because of this internal discord, no ancient civilization proved so dynamic or productive. The Greeks not only colonized the Mediterranean and Black Sea areas but set standards of figurative art which endured for nearly 2500 years. 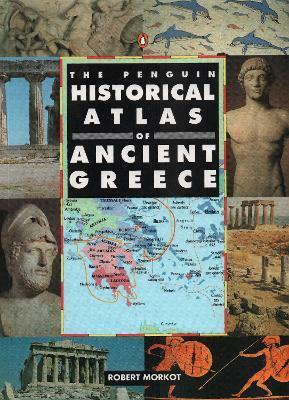 Charting topics as diverse as Minoan civilization, The Persian Wars, the Athenian Golden Age and the conquests of Alexander the Great, The Penguin Historical Atlas of Ancient Greece traces the development of this creative and restless people and assesses their impact not only on the ancient world but also on our own attitudes and environment. Part 1 Crete, Mycenae and the heroic age: origins; King Minos and Knossos; the Mycenaean world; bronze age trade; the seas people controversy; the collaspe of the Mycenae; the Trojan wars; Minoan and Mycenaean art. Part 2 Dark age to Athenian ascendancy: dark age Greece; rise of the city-states; migration and colonization; Egypt and Kyrenaica; the Greeks in Italy; rise of the tyrants; Athens ascendant; the classical myths. Part 3 The Persian rival: Persia and the west; kingdom of Macedonia; Persian campaigns I and II; the continuing rivalry; the rise of Sparta; ancient explorers; Greek literature and thought. Part 4 Perikles to Phillip: Perikles and the Athens empire; Peloponnesian War - the Aegean, Sicily; Sparta and Thebes; Kingdoms of Northern Greece; decline of Athens; Philip and Macedonian expansion; Greek warfare. Part 5 Alexander and after: campaigns of Alexander; Alexander the general; Alexander's spoils; consolidation of the kingdoms; new kingdoms, new rivalries; kingdoms in crises; Roman conquest; architecture of Ancient Greece. Robert Morkot is a lecturer in archaeology at the University of Exeter.